A colleague came up with an interesting situation. A client of ours is proposing to shoot a film on HDCamSR at 1080p24, meaning real 24 fps. The final output will be 35mm film also real 24fps. Being from a PAL country we see no utility on doing the 23.976 - 29.97 NTSC workflow. In fact, when I researched this on the 'net and specifically the Avid Community forum, I came up with mostly NTSC based workflows. Even the Avid MC manual doesn't have any explanation on this. Not surprising, editing system manuals seldom address the PAL 24-25 workflow. I've found that in the non-PAL post world, people mostly work in 23.976 fps. For shooting HD, telecine to tape whatever. No 24fps. Or in variants of 23.98 like 59.94. Incidentally, on FCP this would be easy. All our FCP systems have Blackmagic HD capable cards. And in FCP one can capture the HD as ProRes or DVCProHD and save space. Either way we would be capturing 24fps and editing true 24fps HD. We can then make out an EDL and recapture selects for conform and grading in our normal film grading systems - like Quantel iQ or Resolve. Even Autodesk Smoke or a Quantel eQ could be used for the recapture. We then export as DPX for further processing. All of this is at 24fps. Tried and tested. Works. But on an Avid there is a problem. All our Avids are Mojo SDI Avids that cannot capture HD. So we need to output from the HDCamSR VTR as SD PAL video. And an HDCamSR VTR, when outputting an HDCamSR tape as SD PAL video does so with a speed change. Meaning 24p HD plays out, not at 24fps, but at 25fps. 4% faster. Of course, Avid can capture 25fps PAL material in a film project and make it play at 24fps. But in this process of making it 25fps in the HD VTR and converting to 24fps in the Avid one loses the original HD timecode. So no EDLs, no recaptures. So I did some trials to find a fix. I've tried on a small test clip and sequence, so please do try it out and check if it works. Here it is. First set the HD VTR to do a burn-in TC (also called window burn or TC super). Make it show the original 24fps TC and the 'derived' 25fps TC. It looks like this. TCR is the 25fps 'derived' timecode that Avid will get when capturing, and 'ORG' is the original 24fps timecode. Next, open a film project in Avid Media Composer (this applies to MC MojoSDI ver 2.6 upwards). Capture the HD with deck control normally as you would. After capture set the bin headings like this. Basically you need to be able to see 'Start' and 'TC 24'. Initially, the TC24 column will be blank in the bin. Now open each clip from the bin to the source window and park at the first frame. In the bin enter the timecode you see in your rushes as 'ORG' in the 'TC 24' column. So now, you've 'assigned' a 24fps timecode to each captured clip. Avid will now track both the 'derived' 25fps timecode as well as the original 24fps timecode through your edits. Now you can edit normally. In the 'Film and 24p' settings you can set the edit play rate as 24fps so that the sequence clips will sync with audio if any was recorded separately on location. After the edit is complete, you can export the EDL using EDL manager. But with two small changes. In the EDL manager main window (not settings window), set the 'Source TC' to 24 and 'Record TC' to 24. Now open the seq you've edited and make an EDL. And save it. If your finishing system needs a reference cut, export the sequence as a Quicktime movie. Make sure the Quicktime movie is 24fps. Mind that Avid , when doing a fast export from a 24fps timeline, makes a movie as 23.98 fps. If you have an FCP system handy you can convert this movie to DV-PAL and then use CinemaTools to conform it to 24fps. 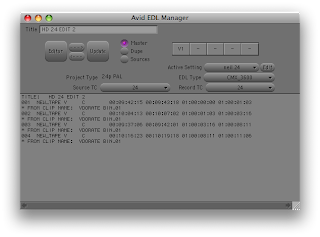 Else just do a custom export from avid as DV-PAL at 24fps. Quantel iQ and the new Smoke and Resolve accept these as reference movies. This reference movie will match clips recaptured from the original HDCamSR tapes at 24fps using the EDL we just made. Please mind that I've tried this for a few clips and an EDL. You should test this thoroughly with your source material before committing to this workflow. And as I said before, if you have the option to work in an FCP system, none of this TC wrangling is necessary. Or, if you haven't got a Avid system yet and have to work in Avid, then get a MojoDX. This allows HD capture. And no TC wrangling. If this method has saved you some labour or made you some money, then consider pressing that yellow button in the margin that says 'Donate'. Sure. write to me and I'll send you my contact info.